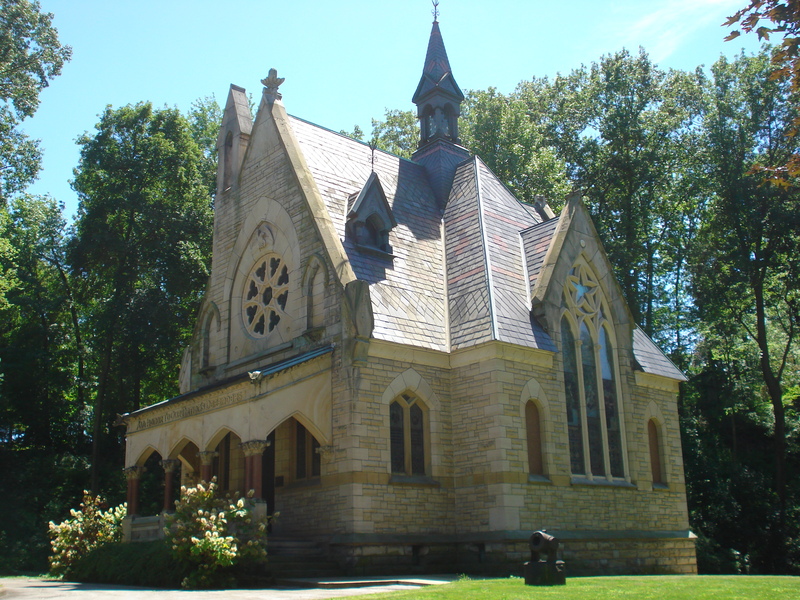 The Civil War Memorial Chapel located in Glendale Cemetery is one of the premier Civil War memorials within the State of Ohio and throughout the United States. 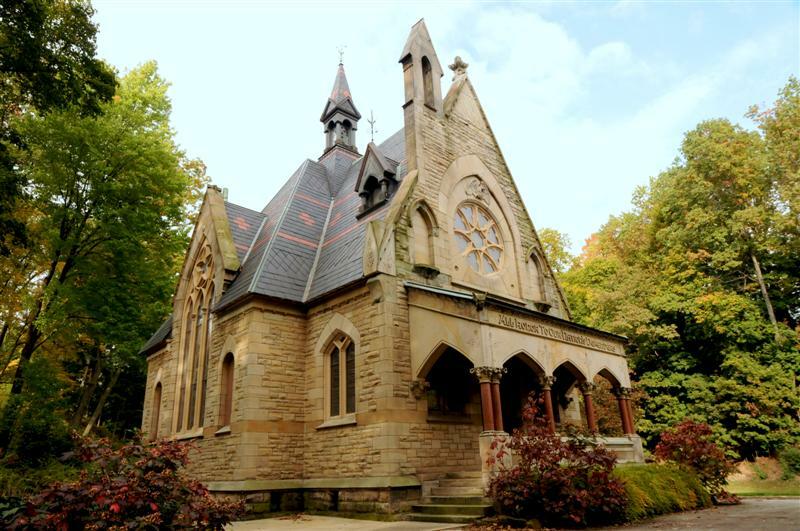 The Chapel was built by the Buckley Post of the Grand Army of the Republic, to memorialize the contributions of all who served in the Civil War, from the Greater Akron Area. The initial campaign to kick off the building fund was a concert at the Academy of Music, on February 14, 1874. After stirring speeches that night by Col. Simon Perkins, David L. King, George W. Crouse, John R. Buchtel, Rev. Richard L. Ganter, and others, over $10,000 was raised through ticket sales and pledges. By July 4th of the same year, the building committee reported having raised $20,000 and it approved the plans of architect Frank O. Weary. The total cost of the structure, minus windows that were donated by individuals, was $25,000. The ground breaking took place on Memorial Day, May 29, 1875 and the official dedication ceremony was held one year and one day later, on Memorial Day, May 30, 1876. The Chapel is built on a cruciform plan and has an area of 1,800 square feet. 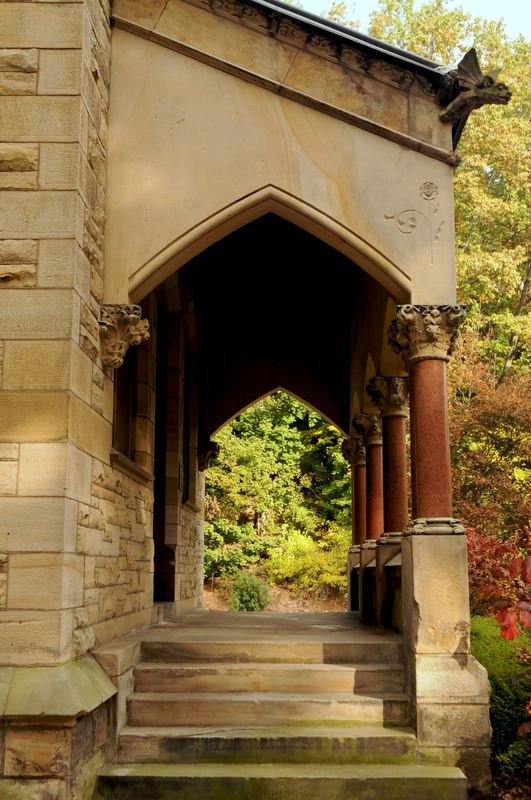 The exterior walls are constructed of broken ashlar stone and there are six columns of polished granite that support the entrance porch. The roof is constructed with black slate highlighted by red slate. The interior walls are constructed of “Constitution” stone from the banks of the Ohio River near Marietta. The floor is covered with Minton tile imported from England and the ceiling is polished butternut wood laid in diagonal strips. The most striking features of the Chapel are its handsome memorial windows. The glass is European rolled cathedral glass imported from Scotland. The three window panels that comprise the north facing window honors the service of women in the war and was donated by the Ladies Cemetery Association. The three panels that comprise the south facing window celebrates the U.S. Centennial (1876), depicting George Washington, Commodore Perry and Abraham Lincoln. The large chancel window at the west end of the building memorializes Col. Lewis P. Buckley and the 29th Ohio Volunteer Infantry Regiment. 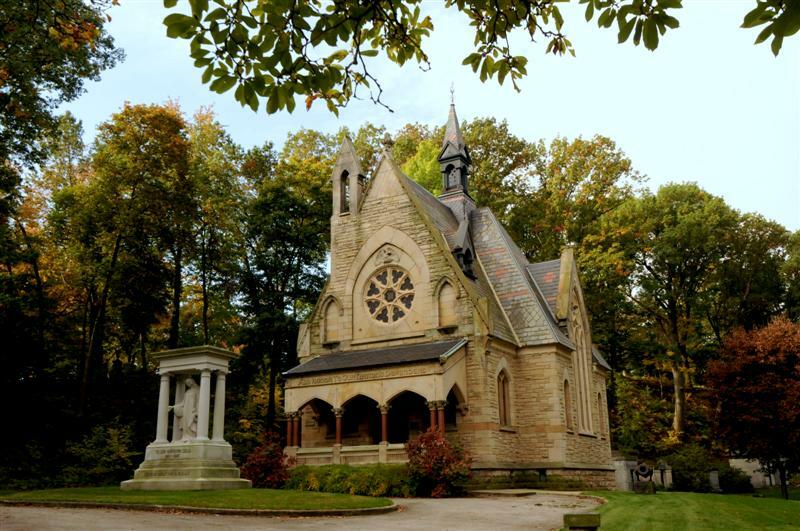 For over 162 years, with its Memorial Chapel, Glendale Cemetery has remained one of the most significant, historic sites in Akron. 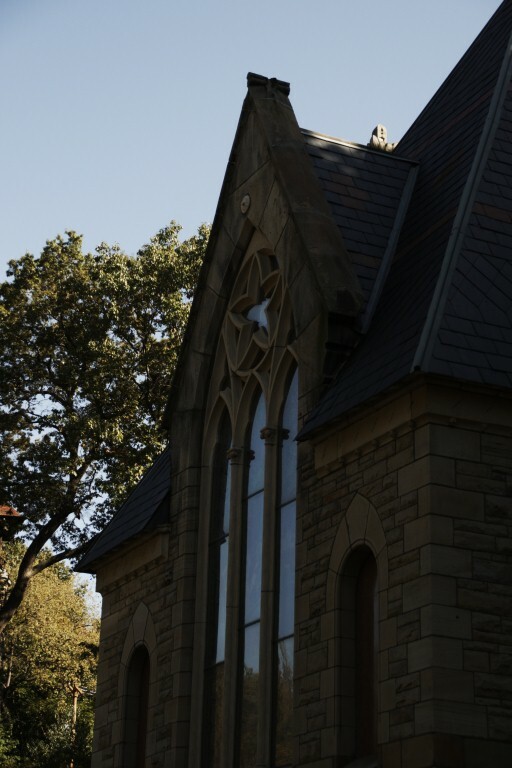 On July 25th, 2001, a re-dedication ceremony was held to celebrate the past three years of work to restore the Memorial Chapel. 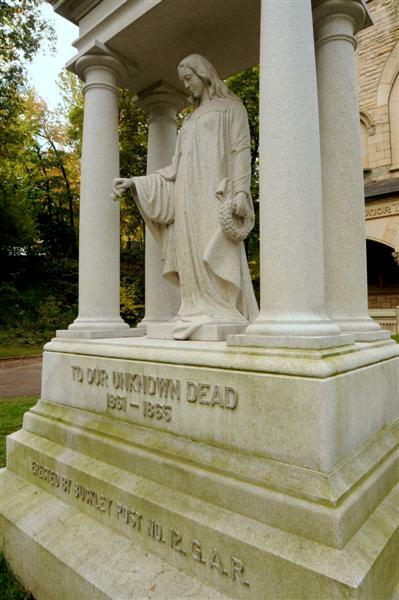 To date, over $750,000 has been raised by the Akron Civil War Memorial Society to fund the current restoration. All of the funds have been contributed by charitable foundations and individuals who have a strong commitment to the Akron area. 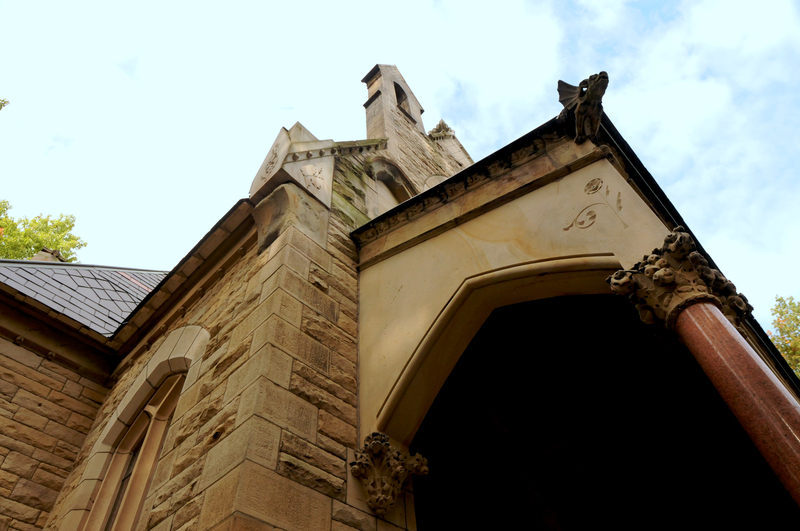 The Akron Civil War Memorial Society continues to seek donations for an endowment fund, that will assure the memorial Chapel’s perpetual maintenance. To make a donation for the continued care of the Chapel, please visit our Donate page, or click on the following link for a printable donation form.